On September 29, a Pakistani immigrant was badly beaten by a group of hooded assailants in Kypseli square in Athens. According to witnesses, the man eventually broke away from his assailants (probably members of a far-right group), who hurled two firebombs at him but missed their target. Two weeks ago, in the district of Aghios Panteleimonas, near central Athens, Qadir Hussaini, an Afghan translator working for the Doctors of the World aid group was attacked by a group of around 20 people and beaten senseless. These (and other not so severe incidents) attacks are part of a systematic pogrom against immigrants in Athens. Meanwhile, on 22 September 2010 15 sans papiers, imprisoned in the police station of Chania (Creta) went on hunger demanding their freedom. The Minister of Citizen Protection Mr Christos Papoutsis and the European Commissioner for Home Affairs, Ms Cecilia Malmström met in Athens on 27 September to discuss ways to assist Greece in its efforts to reform the Greek asylum system. 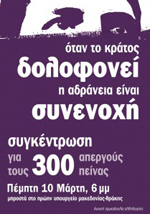 They acknowledge the unprecedented pressure on the Greek asylum and migration management system, which is a result of large number of persons from third countries entering Greek territory both as irregular migrants and as asylum seekers, due to its geographical position at the EU external borders. Greece underlines the additional burden as a result of the implementation of the Dublin II Regulation. In the framework of a common European migration and asylum policy, the challenges faced by Greece have to be commonly addressed by the European Union as a whole. The Greek Government has decided to reform the national asylum system, in order to better address, in an efficient and coherent way, the needs of asylum seekers arriving in Greece. The European Commission greatly values the strong commitment of the Greek government to undertake all possible efforts and considers that it is paramount to make rapid progress in improving the situation. Coordination is needed at European level to address pressures on the Greek national asylum and reception system. The Commission and the EU Member States have already expressed their readiness to assist Greece in the implementation of the ambitious plan of reforms. Once the European Asylum Support Office becomes fully operational, it will coordinate the provision of support to Greece. Creating screening centres and adopting a modern procedure for screening, registering and managing migrants. Establishment of a Project Management Team that will have the responsibility to steer the implementation of the Greek plan and coordinate assistance with EU partners. A first meeting should be called as soon as possible. The Commission has offered a package of financial and practical assistance in support of the Greek efforts. In parallel and in close cooperation with the Greek authorities, the Commission intensively examines the possibility of providing Greece with effective EU support to address urgent needs and other activities planned during the transitional phase. Several EU Member States have already declared their preparedness to assist Greece by providing assistance through, in particular, practical cooperation. Concrete actions must be launched in the coming weeks. Both Greece and the Commission underline the important role of the UNHCR. The Greek authorities work already in close partnership with the UNHCR. A strong partnership with the UNHCR in this process is considered key in reforming the Greek asylum system. Close cooperation between EU Member States, assisted by the Commission is a key to the establishment of the Common European Asylum System, by 2012. The Commission is committed to present appropriate initiatives and propose adequate measures at European level towards achieving this goal. On one hand, there is a radical current that can be defined as developing a discourse for absolute freedom of movement and settling, against borders, against the state and against capitalism. This discourse, often connected to direct actions, tries to frame the fight against anti-migration politics into a criticism of the capitalist system. Nevertheless, the way it is expressed is often reduced to a total rejection of all capitalist structures, which only reaches to people already convinced. On the other hand, we can identify a moderate current, that emphasizes more on the process of migrants regularization and the opposition to detention-camps. This discourse usually reaches a deadlock on the question of linking political and economical frameworks in which anti-migration politics are integrated. 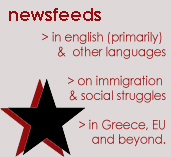 We realize that these different discourses have in common to focus mainly on the repression against migrants. The insistence upon this question is understandable, it is the most outraging aspect of the situation of migrants, who themselves consider it as the main issue: to exit the circle of repression and to be able to live a “normal” life. We think, nevertheless, that there is a designated weakness, a one-dimensional aspect of the No Border discourses. The capitalist handling of migrants work and its effects on economic matters and social rights has nearly never been used as a central argument in the opposition to borders and the fights for freedom of movement. Furthermore, except Frontex, we can consider that the “european power”, despite its decisive and organizational importance concerning the handling of migration movements, has being globally spared off criticism and actions from the No Border movement. Leaving this aside constitutes from our point of view a paradox : we are many to think that the handling of migrations reveals the real face of capitalism and ables us to look through the future trends in our societies evolutions (militarization of borders and of the society in general, control-technologies development, labour precarisation, social rights and freedom of speech destruction…). Nevertheless, it’s very seldom that, beginning from the migration question, we manage to develop discourses or actions concerning other aspects of society. Migration exists everywhere, internationally or locally, linked to wars, work or studies, as a result of climatechange or meetings. Many from us don’t speak the languages of their grand-parents, we don’t live where our parents lived and our movements will not hold back. “Migrants” or “natives”, the only identities stamped on us, are printed by the state on paper and those printed by advertisement and tv in our minds, identities that are strange to us. The classification between migrants and “natives” has no sense anymore. However, those who are communally called “sans-papiers” are particular migrants, their rights are non-existant, they are forced to clandestinity and they represent the figure of the ultimate “foreigner”. The capitalist system makes them marginal and applies on them particular politics. These politics and their links with “the rest of society” are what we are interested in. The development of European migration policies should be analyzed in the context of the development of the European Union, in so far as it is a process of an economic system opening up its labour market. By observing E.U.’s history and the enlargement process that followed throughout its 60 years of existence, we can see that the capitalist handling of migration movements is directly linked to the economic situation. Periods of crisis or economic growth can transform migration policies radically, which in turn can have huge effects on economic and security policies. In the last century, after the second world war, work-related migration began to intensify. The first important wave of migration, in the fifties and sixties, had been constituted by “industrial” migration, particularly from the South of Europe and other Mediterranean countries to the northern countries. Thirty years later, the fall of the “iron curtain” provoked a new wage of migrants coming from the East attracted by the image of “safe old Europe”. Simultaneous to this process, the number of non-Europeans trying to join Europe, increased from year to year. We can consider one main difference between migration politics in the fifties and those from the eighties on. For a first time, industries and mines needed cheap and numereous work forces, which implicated a relatively “open” migration. In succession, the de-industialisation, the end of full-employment and increase of mass-unemployment activates a drastic restriction of conditions of migrations. This difference in the handling of migration movements let the economic interests appear as the main criteria used by the capitalist system to define their migration politics. Today, in the enlarged E.U., European institutional system architecture has reached a new dimension and a higher level in terms of state cooperation (Dublin II) and security procedures. Since the collapse of the Soviet-union, the borders of the “project Europa” expanded and the Union took the chance to build up an gigantic security architecture, based on the development of new technologies and huge financial possibilities. This was followed on the first stage by the construction of detention camps and the increase of social control on a domestic level. 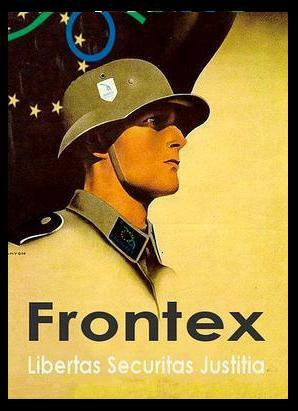 On the second stage, countries like Italy, Greece and Spain started to build more and more defense mechanisms against migration, with the help of the European migration agency Frontex. These countries constitute the final internal barrier against the infamous “invasion of Europe”. Finally there is an externalization of the borders to Mediterranean countries like Libya, Tunisia and Morocco where European funds are being used to build detention camps and to improve the control of their borders. The deaths at the borders in the Mediterranean Sea and conditions of detention camps like Pagani in Lesbos, are not produced anymore by a single country interest but are part of European economical and migration strategies. Parallel to this expansion of repression and militarization of borders, we witness the reconstruction of the labour-market. The tricky part for the state government is to keep the balance to control effectively this market. The governments use migration in two principal economic ways. On one hand, they try to control migration to answer economic needs, a limited and specialized migration. And on the other hand, they use immigration to promote competition between workers, and from there to limit the social demands and deregulate the labour-market. Selection of work-permissions (in function of the markets needs), flexibility of work (unregistered work, part-time-work), reduction of wages, attacks against social rights, destruction of pensions, the ever increase of rents. All these dynamics can only be seen as an the levelling of work conditions of local workers to the situation that migrants know since a very long time, with clandestinity as a special bonus. This is the objective of governments and European institutions. At first, the work conditions and social practices are being applied to migrants, legitimating this particular status by the fact that they are foreigners without any rights. After that, technics for managing migrations are expanded to the handling of the whole population. Of course, at the heart of this dynamic, stands the public argumentation on “unproductive and benefits abusing foreigners”, designated responsible for all economic and social disasters in our societies. These strategies of migration/population control make clear where the E.U. is heading for: a stable migration policy, tight social measures (now and then, depending on the situation of home-economy) and a new promoted euronationalism to take its position as a global player on the global market, Germany and France in leading position. The long-term goal is to liberalize the market and to drop the “social-state”, to stay alive in the competition against the “masters of workers-oppression” USA and China. This new ideology of euronationalism is based on the development of a European historical understanding after the second world war. The history is being turned around in order to redefine a new Europe which has learned from the two world wars and is heading to « peaceful » economical and political state-cooperation. This theory forgets about the ongoing social war, the exploitation of workers and migrants, and about the ongoing “humanitary” wars and other operations of “maintaining peace”, via NATO or not, from different European countries in Serbia, Afghanistan, Irak or Somalia. Last years have showed that this ambitious project is very difficult to fulfill. On the political level, the rejection of a European Constitution by some member states damaged this “European dream”. On the economical level, the financial crisis, which started at the beginning of the new century, stopped the economic growth and revealed one more time the effects of world competition, overproduction and speculation. In this time of crisis and (for now) failure to achieve these aims, one of the principal questions is: how will the state-governments try to compensate the handling of “the financial threat”? It has been two years since the banks and stock markets began to collapse. Billions of Euros have been wasted, designated banks are being reloaded by incredible profits, others stay unstable, and the breakdown of stock-markets and the Euro continues. In a short time, the crisis of the financial system became a crisis of the states. After doing everything to save the financial system, the governments begin now to make the “people pay”: Greece, Romania, Spain, Great Britain… This umpteenth crisis of capitalism is, as usual, a wonderful opportunity for the governments and the international institutions: austerity-plans, which have been or will be voted for, are real plans of social destruction. This first opportunity of a real act of “European-crisis-management”, after the IMF-intervention in Romania, was the state-debt crisis of Greece. The international capital, in form of the E.U., IMF and the Greek state, tries to turn the country in a social-experiment-field for a new shock-doctrine. Many social rights that have been defended by workers since three decades, will be abolished within two years. The first package of measures voted on the sixth of May by the Greek parliament shows the way: cut in wages up to thirty percent, freezing of wages and pensions in the state sectors. These measures on wages are followed by an increase of sell taxes and special taxes on tobacco, alcohol and betting. Changes will also occur in the social system: cuts in pensions and unemployment benefits, destruction of social security. The next waves of measures are being prepared for the next year, under the severe surveillance of the “control commission”. The effects of the austerity policies are just beginning to produce their effects: massive job cuts, more and more part-time jobs and mass creation of temporary employment. Finally, the austerity-plans imposed in the frame of “the” crisis are certainly a new stage in the process of precarisation of work, in the application of handling techniques of immigration as means of population management. Far away from being exceptional policies, these anti-social reforms are the logical continuation of dynamics which started with the creation and development of the European “project”. The specificity of these measures can be found in their rarely seen social violence and their integration in a more and more racist and security-focused political frame, in a political project based on fear management. If we observe the discourses developed by governments, we assess that they justify their handling of the crisis by fear driven arguments, with the foreigner as fear’s principal cause. The handling of fear as a mechanism of social transformation operates in different ways. One way is to create a physical fear, based on the figure of young delinquent migrants, to legitimate the development of control technics (police presence, cameras, archiving…) and repression structures (construction of prisons and detention-camps, “freedom” laws, agile justice…). This fear takes on symbolic forms, specifically based on “unaddressable differences” between Islam and “western way of life”. Controversies around supposed habits like the way people dress (veil), sexuality (polygamy), food (hallal quicks and scrificial lambs), are nothing but symbolic manipulations created in order to give impressions of a threat looming on occidental traditions and of a superiority of these on an archaïc muslim way of life. Furthermore, it is about to create an economic fear based on the rarity of work and on the figure of the working migrant, in order to accept at the end the deregulation of labour. These politics of fear are naturally articulated around the motion of crisis. Should it be to invest billions in banks or to impose anti-social reforms, the governmental discourses remain the same: “In the context of the crisis, sacrifices are necessary to save our system”. This appeal to economical patriotism doubles in a appeal to cultural patriotism, in a discourse on national identity, on the peril for our societies represented by migration. In this manner, the governments present themselves as defending the electors and channel popular anger against the capitalistic inequalities towards the figure of the migrant, seen as the ultimate economical, physical or cultural enemy, both inside and outside. This process aims to hide that the consequences of the crisis are the same for “natives” and “migrants”: an aggravation of life conditions and a intensified tracking of all the non-profitable individuals – fired workers, unemployed workers cut off from benefits, detained and evicted migrants. Socially, we can expect that the current reforms produce effects going in two main directions: on one hand, a questioning of the institutions and even maybe of the capitalist system; on the other hand, an identitarian fall-back and a strengthening of xenophobic feelings and discourses. These two directions may seem contradictory but are nonetheless often complementary. In an organized form, they are expressed in the progression of right-wing political parties and racism issue within some Unions. On an individual level, the mixture of anti-institutional and anti-migration feelings are developing in alarming manner. This is where the central challenge but also the principal danger for the No Border movement lies: in the risk of reinforcing and anchoring durable xenophobic feelings, in the risk to return to a national and nationalist Europe, more and more closed and racist. Some have answers to this question. Where we are looking for cosmopolitanism the governments are playing on tensions between communities and goading on the fear of the other. Despite this, we begin to see the development of social movements opposing to economical state policies, for example in Romania and Greece. In Greece a heterogeneous movement with different political goals has been protesting against the austerity plans of the government, IMF and E.U. The biggest success of this mobilization, mainly controlled by the social-democratic unions, was the fifth of May, when hundreds of thousands of people all over Greece took part in the most massive demonstrations since the end of the Greek dictatorship in 1974. State-employees, private workers, anarchists, students and also migrants participated in the storming of the parliament. During the waves of attacks on the parliament a shocking message arrived over the mass medias : three people lost their life in a fire attack on the Marfin-Bank. This event paralyzed the movement and on the sixth of May the parliament could vote calmly the first measure-package. All over Greece, discussions, in anarchist circles and outside, opened about militant practices and the movement’s heterogeneity. The day of the fifth of May showed what could be possible for a social movement, but also how a movement can be paralyzed in a time where radical social changes are possible… Predictions for the moment are hard but one thing is sure: The Greek government will continue to push austerity measures and will most probably be confronted again with protests. In a global perspective, we could assert in the last years that the European social movements often stay closed in a national logic of defending existing social rights, which makes it difficult for them to enlarge their criticism beyond the opposition to a particular reform and to consider other solutions than these attached to the historical nation-state framework. It is actually one of the biggest challenges for the Greek movement: the abandon of nation oriented views and the hope for a democratic reform of the system. To achieve that social revolts leave behind their national identities, it’s important to leave the isolation of the no-border-movement, to create links with actors of the ongoing struggles. Obtaining this result implies to underline the handling of migrations in the locations where the effects of crisis are being felt and discussed : in the spaces of discussion or struggles (assemblies, publications, sites, occupations and also syndicates) and in the places of life and work (banlieues, schools, universities, companies). Under this view, there are simple truths never worthless to remember. First that the migrations have always existed and will always exist. The project intending to stop them can only produce « barbarous » and «inhuman » practices, unable to spur migration movements. Furthermore, it is obvious that even the deportation of all the « sans-papiers » will not bring back full-employment and would not provoke any rise of wages. Unemployment, as well as the reducing of wages and social rights, are never the result of the presence of migrants, they are an integrated part of the capitalist system. In other words, the movements of struggle against the European anti-social reforms will win nothing from an opposition against migrants. On the contrary, finding the common between “migrants” and “natives”, managing to link all workers and unemployed, with or without papers, in a same process, ables to consider common discourses and actions. During the « anti-CPE » movement in France in some cities, connections have been created between students, workers, migrants and banlieues inhabitants. These connections were notably expressed in the position-taking of student assemblies against the CESEDA law on migration, but also in the streets, during direct actions and confrontation with the cops. Of course, union directions, medias and politicians focused only on the criticism of CPE and on the raids of youngsters of the suburbs against demonstrators in Paris. They know what they have to lose from the connection between suburbans youth and resistance movement : the events of December 2008 in Greece and the NATO-Summit of Strasbourg are there to remember them. In contrary, we know what we have to win : an enlargement of theoretical and social criticism, and an augmentation of power. On this issue, one of the main challenge is to make social movements take position and action on the question of migration. But to make these connections, it is not enough to stay in the level of debates and ideas. In the perspective to enlarge the prospects of the No Border movement and of the movements against austerity-plans, in the perspective to augment our power, we are finding us in Brussels during the No Border camp. In fact, Brussels gathers at the same time the principal European institutions, hundreds of lobbies, financial groups and headquarters of multinationals, a big part of the Belgian governmental buildings and important migrant neighborhoods, which are vivid examples of gentrification and from time to time of revolts. This concentration of economical, financial, political and anti-migration institutions present a magnificent opportunity for us to show our presence and our force, to bring our arguments to the public place and to participate at the contestation of the capitalist world by using a diversity of our modes of action. In this way we are confronted with a double and paradoxical existence : on the one hand, everybody – no matter what his or her ethnical belonging, social status, or character- has to have the right to access this bureaucratic jungle that our society has become ; on the other hand, it is unacceptable that the fate of humans is so divided by a gargantuan calculator, of which the inhumane character is incompatible with the right for a free and beautiful life. If we add to this a process of state collapse because of financial forces. States who in their turn are threatened by a worldwide monetary collapse. States have lost the privilege – that they arrogantly claimed-, to look after the public goods. Yesterday still, they took their levies from the citizens by fierce taxes and fines, but in return they took care of public services – education, health care, postal services, transportations, unemployment benefits, old age pensions. What has happened to this now ? States have become the valets of banks and multinational enterprises. These banks and enterprises however, are confronted with the fiasco of insane money, a whirlwind of billions of investments in financial speculations, where money flies around, instead of working on the progress of primary industries or other sectors with a social use. Billions forming a bubble bound to implode and to provoke a great monetary crash..
We are the prey of managers of bankruptcy, eager to reap their last short term profits overexploiting citizens, the same citizens that a demented austerity policy invites to sacrifice themselves, to fill the bottomless deficit gap, dug by monetary embezzlement. Not only can the state no longer fulfill its obligations as seen in the old social contract , the state even cuts the budget of public services. Burying everything that guaranteed, if not a real life, at least survival. And the reason given for this is a great swindle called public debt. The state has folded itself back upon the only function that reminds itself of its reason to exists: police repression. The only lifeguard of the state is spreading fear and despair. The state accomplishes this rather efficiently by spreading an apocalyptic worldview. It spreads the rumor that tomorrow will be worse than today. Wisdom consist according to this view in consuming, spending before going bankrupt, make profitable everything that can be made profitable, even ruining its own existence and the whole planet , as to make this great swindle last forever. The fight supporting undocumented migrants should take into account such a context, in several ways. a)The state takes attention away from the way in which public goods are rerouted, the state installs fear and discouragement, and entertains it, so to fulfill its role as a security police. And, as always is the case in such conditions, it uses the old tactics of scapegoating. For citizens, frightened by the rise of unemployment, the lowering of purchasing power, the rise of precarity, it names some ‘dangerous ‘ groups that will serve to reroute the anger and aggression, that would otherwise be directed against the corrupt exploiters that govern us. Everything is good to keep up the smokescreen that masks the real problems.. While in Belgium Walloons and Flemish are both as much victims of the mishandling of the state at the fringe of a financial gap, there is a criminal nationalism that tries to put one group against the others . A shifty xenophobia aims to identify people of Arab descent as Islamic terrorists. , it turns into anti-Semitism the grounded opposition to the anti-Palestinian politics of the Israeli government, it works to oppose unemployed workers and undocumented migrants, it does not blink to resemble the nazi’s in the way they despise and treat gypsies (Rom and other travelers). We have to take into account that the corrupted state does everything to hinder a true solidarity between have-nots struck by precarity, and those who still enjoy a little bit of good existence, bur who’ll lose this security if they do not accept the fate that awaits them. It is this solidarity that we need to restore, and it is to this solidarity to which we appeal when we defend undocumented migrants, unemployed, but also workers who fight their exploitation, organisations preparing the autodetermination and the abolishment of money, movements that fight the cuts in public transportations, , education, health care, postal services, primary industries and agriculture. We will defend the poetry of life against the laws of profit that degrade life. b)answering the repressive politics of a corrupt government, does not mean using the same violence against the state, the answer is going beyond their humiliating dictates, it’s propagating civil disobedience.. How ? By interfering to restore a quality of life that the state has ruined under the pressure of maffia bankers. We are all left-behinds, sacrificed for the morbid interests of an absurd system. We do not have another choice than to bet on ourselves to get out of this mayhem. There is, within most women and men a poetic richness and a creativity capable of installing in all domains more humane conditions . Many people, pacified by routine, ignore this still. But it is often the only source that those people, scapegoated and marginalised by the politics of corrupt democrats, have. In stead of trying to bring someone down, we should valorise the human and creative aspects of someone. Is it not an awful shame to fear and chase gypsies, instead of developing their artisanal and musical resources so that every passage they make turn into a joyous event. Instead of trying to re-integrate unemployed in a labour market upset by the multiplication of enterprises shutting down, why not let structures develop where each ones potential and imagination can develop fully? The struggle for undocumented migrants slides too often into a desperate, even suicidal defence. But offense is the best defence. Not an aggressive answer, like a police intervention remote-controlled by a functionary who calls for austerity with those that he ruins. It can be an offensive who installs everywhere spaces liberated form profits, market and commerce. Spaces where the right to live, to be happy, to create, spaces for beauty, for enjoyment reject the rights of barbary, commerce and survival of the richest. We will have to fill up the gaps that the state lets, as it furthers away form the demands of citizens. It is up to us to prepare ourselves starting now if we do not want anymore that taxes serve as gapfilling for banking mistakes and speculation on the stock market. Our main task, is restoring poetry in a society where the taste for profit and power have removed all poetry . In a blindly aggressive world, drawing, reinventing, giving priority to human values, like generosity, creativity, enjoyment, an autonomous life.. Becoming human means denying the slavehood of labour and the power to proclaim your right to be happy creating good conditions for the benefit of all. To become human again means to stop being slaves of work and power and to reaffirm the right to happiness creating the conditions for the creation of happiness for all. Signed today by the Minister of Civil Protection, Christos Papoutsis and promoted for signature to the President of the Republic Karolos Papoulias, the draft presidential decree “procedure of identification of foreigners and stateless refugee status or subsidiary protection. The draft presidential decree must be signed by Minister of Interior, Public Administration and Decentralization Ragousis John, Minister of Justice and Human Rights Transparency Kastanidis Harris, Minister of Health and Sport Andreas Loverdos and Deputy Finance Minister Philip Sachinidis. country. The provisions drew the special Standing Committee of the Ministry of Civil Protection and finalized after taking into account the comments of the ministries. where there is a large concentration of foreigners. Enters a decision deadline 3 months in an accelerated procedure and 6 months in the normal process. Defined as the bodies responsible decision in first grade, the Secretary General for Public Order in the normal process and the Managers of Police in charge of the investigation authorities to fast track. Introduced transitional arrangements for the relevant bodies and the process of pending applications for international protection and appeals. This is a summary of what was said by UNHCR spokesperson Adrian Edwards – to whom quoted text may be attributed – at the press briefing, on 21 September 2010, at the Palais des Nations in Geneva. UNHCR is today calling on Greece to urgently accelerate implementation of its planned asylum reform. This is in light of the continued absence in Greece of a functioning asylum system, an issue with important implications for the wider EU. The conditions for asylum-seekers in Greece, which is among the principal entry points to the EU, are notoriously difficult. Most asylum-seekers receive no assistance. Many live on the streets, including women and children. The refugee status determination system does not operate properly and as a result, persons needing international protection are not identified as such. This is a humanitarian crisis situation which should not exist in the European Union. UNHCR welcomes Greece’s plans to implement a far-reaching reform of its asylum system even in the face of current economic challenges. We also appeal to the European Union to step up its assistance to help Greece to comply with its international and European obligations. Until such time as an asylum procedure meeting international standards is in place in Greece, UNHCR reiterates its recommendation to other European countries not to send asylum-seekers back to Greece under the Dublin II Regulation. Yesterday, in a statement, Human Rights Watch called on UNHCR to intervene and take on responsibility for refugee status determination in Greece in light of these shortcomings. UNHCR notes this recommendation, but emphasizes that responsibility for asylum rests with the state, and as an EU member, Greece is bound by European Union legislation to have laws and procedures for dealing with people seeking asylum. The UK Border Agency has announced today the suspension of the return of asylum seekers to Greece under the Dublin Regulation. With immediate effect, the backlog of approximately 1300 cases and all new cases will have their applications heard in the UK, and not Greece. This will come as a great relief to all those facing return to the “broken asylum system” of Greece. The decision-making process in the UK leaves a lot to be desired but at least we have legal aid (for now, and only just) and the initial sucess rate is more than Greece’s 1%. The decision comes as a result of the Court of Appeal’s decision to refer the case of NS (formerly known as Saeedi) to the Court of Justice of the European Union. It appears that this process could take up to two years, so the UK Government has decided to use it’s powers to assess asylum claims in the UK during this period, rather than have the applicants wait for the outcome. The UK Border Agency has stressed that this decision is purely pragmatic, and is in no way related to the mulitiple human rights abuses and the near impossibility of claiming asylum in Greece, as highlighted time and again by the United Nations refugee agency, the Council of Europe Commissioner for Human Rights, Human Rights Watch, Amnesty International etc. (Brussels) – The Greek government’s failure to follow through on its promise to reform the country’s broken asylum system creates an urgent need for the UN High Commissioner for Refugees and the European Commission to intervene, Human Rights Watch said today. A presidential decree that would introduce emergency reforms, which had already been postponed until September 1, 2010, has been pushed back again for several months following the recent government reshuffle. Full-scale reform of the system is now unlikely before the end of 2011, at the earliest. The delayed presidential decree would have addressed the backlog of more than 45,000 cases and reinstated a flawed appeals procedure for rejected asylum seekers, but would not have addressed more fundamental reforms. The decree will also require review by the new minister of citizen protection, the Finance Ministry, the Council of State, and the president before it enters into force. Substantive reforms to create a functioning asylum system, including an independent body for assessing claims and more effective appeals procedures, were expected to be introduced in late 2011. But they are now also likely to be delayed, Human Rights Watch said. “The postponement of long-awaited, interim fixes means that Greece is not even back to square one in the process of repairing an asylum system in need of a complete overhaul,” Frelick said. The European Commission should also keep the pressure on Greece and support intervention by UNHCR, Human Rights Watch said. The Commission has taken the first step to hold Greece accountable for its violation of EU law, issuing two formal letters to Greece in a process known as an “infringement proceeding,” which could ultimately lead to action in the European Court of Justice. The letters were sent on November 3, 2009, and June 24, 2010. Greece recently presented an action plan to the European Commission that lays out the government’s reform agenda. The action plan will not improve conditions for asylum seekers, however, as long as actual changes are stalled, Human Rights Watch said. In light of the new delays, the Commission should send a reasoned opinion to Greece identifying concrete areas for improvement. A reasoned opinion would represent the next step in the infringement procedure. The Greek government has repeatedly promised to overhaul the asylum system and to support those in need of protection. Its stated intention to reform, however, coincided with a severe financial crisis, which limited its ability to follow through on these promises. The country has one of the lowest rates of granting refugee status for asylum seekers in Europe. In 2009, it granted refugee status to a mere 0.04 percent of applicants at first instance – 11 people out of almost 30,000 applicants. It also abolished the appeals mechanism in July 2009, leaving rejected asylum seekers with no way to challenge a negative decision, and leading UNHCR to suspend its formal role in the asylum procedure. Filing an asylum application is very difficult, and interviews are typically conducted in a cursory manner, often without a qualified interpreter and by untrained police officials. In addition, the country provides almost no accommodations or other assistance for asylum seekers, with most in destitution and living in the streets. Vulnerable groups are hit the hardest. Unaccompanied children, for instance, are left to their own devices and at risk of exploitation. Some asylum seekers in Greece have taken dramatic steps to solve their plight. A group of Iranian asylum seekers went on a hunger strike to demand refugee status. The Greek government recognized them as refugees only after their health had seriously deteriorated. Greece faces a double burden due to its location and the European Union’s Dublin II regulation, under which the first EU country an asylum seeker enters is generally responsible for examining that person’s refugee claim. Migrants’ fingerprints are entered into an EU-wide database so that the country of first entry can be identified. This regulation puts an increased burden on countries at Europe’s external borders, particularly Greece. Greece currently faces more than 10,000 requests by other EU member states that want to return migrants and asylum seekers there. In addition, it continues to receive a very high influx of migrants and refugees. About 75 percent of the 106,200 irregular migrants entering the EU in 2009 first arrived in Greece; that percentage has risen to 80 percent in the early months of 2010, The Economist reported. The Belgian Presidency of the EU is currently seeking consensus on a modest but significant reform to the Dublin regulation proposed by the Commission that would allow the temporary suspension of Dublin returns in crisis situations, but the changes face significant opposition from some member states. Currently, more than 750 requests to return people to Greece are blocked through intervention from the European Court of Human Rights, and far more are pending before national courts across Europe. Courts increasingly cite evidence of Greece’s dysfunctional asylum system and lack of assistance to those seeking protection in decisions to block their return to Greece. Should Greece overhaul its asylum system and provide assistance to applicants, however, courts will be more likely to approve the returns under Dublin, and add to the country’s burden again. The United Nations Refugee Agency (UNHCR) yesterday expressed “extreme concern” following a string of violent attacks involving immigrants in the district of Aghios Panteleimonas, near central Athens. “The attacks and brawls have created a tense and explosive atmosphere which is unsettling local residents,” the UNHCR said. The agency called on authorities to avert similar attacks and “promote initiatives to tackle social exclusion.” The UNHCR’s appeal follows a recent wave of violence that started with a vicious attack on an Afghan aid worker by 20 assailants last Saturday. On Thursday, three Afghan men were charged with attacking an Albanian minor and two Greek nationals who came to the latter’s aid. Later that day, unidentified arsonists torched a cafe owned by an Afghan and two Bangladeshis stabbed the owner of a local convenience store before fleeing with his takings. Commission of Iranian political refugees started its struggle on July 20 2010 [with a hunger strike] outside the UN High Commission for Refugees office in Athens. Our First victory came by gaining political asylum recognition to six Iranian hunger strikers. One of them, Hamid Sadeqi had sewn his mouth. Now we continue the struggle in the center of Athens at Propylaea (University of Athens), demanding asylum for all refugees! We expect by the government the announcement of the strarting day of the sessions of Asylum Committees, as it was promised: “The transition process for Asylum under the new presidential decree is expected to be operational in September”(06/08/2010). No more fake promises! There are thousands of refugees waiting in vain without any information on their case. Children born in Greece or came on an early age and now grow as if there is no future! What should the children and their families do to get asylum after 5,6 or even 12 years? Do they also need to sew their mouths? We fight for the vindication of all refugees. We fight to stop the violation of our rights. We were persecuted by dictatorial regimes and illiberal states like Iran and suffered prisons, torture, death penalty, disappearances and also hunger and poverty. How to live in countries devastated by war such as Afghanistan, Iraq, Somalia? How to survive in Pakistan, where half the country sank beneath the waters and the indifference of the government scatters despair, disease and death? How to live in African countries that have been ravaged by famine?